← Autism Has Its Good Side! For centuries, the tamarind benefits have been recognized for its ability to reduce fever, relieve sore throats, alleviate flu symptoms, and much more. Did You Know…a popular pod fruit can effectively fight off the flu and eliminate sore throats almost instantly? The tamarind (Tamarin-dus indica) is native to tropical Africa. Thanks to human cultivation, it’s now found also in South and Southeast Asia, Northern Australia, Mexico, South America, and the Caribbean. Tamarind pods have hard brown shells, inside of which are black seeds and a delicious and extraordinarily medicinal pulp. In the young fruit, the pulp is sour and acidic, and typically used in savory dishes. As the fruit ripens, the pulp grows sweeter. Mature tamarinds are often used for desserts and drinks, or simply enjoyed as a snack. 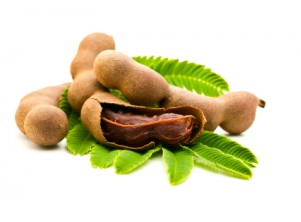 Tamarind can be particularly useful in warding off flu and colds. The bark of the tamarind is significantly effective for reducing fevers. The pulp, on the other hand, can ease stomach pain and prevent digestive disorders, such as constipation. In addition, tamarind benefits include soothing and eliminate sore throats, another common complaint among flu sufferers. Experts say that gargling a glass of tamarind water (easy to mix up by stirring tamarind paste into water) can eliminate a sore throat almost immediately. Tamarind can even reduce cholesterol, and as a result, improve heart health and prevent cardiovascular disease, heart attack, and stroke. Tamarind is readily available in the United States in fruit-paste form. Health practitioners say this paste can be consumed in a number of ways. For instance, you can nibble it throughout the day, or add the pulp to water to make a juice or tea. Bear in mind, though, that tamarind flushes your body of toxins. Thus, it can have a mild laxative effect, so health practitioners advise you to start with modest quantities and adjust gradually. If you’re taking tamarind to cure a cold—and especially if you’re trying to clear your nasal passages—the method most often recommended by health experts is to prepare a glass of hot tamarind rasam. Rasam is a spicy soup with Indian origins, now enjoyed worldwide. Recipes for rasam abound. Today, there are endless variations on this immunity-boosting delight. The best recipes require you to grind your own special tamarind paste from scratch. The effort involved is well worth it, though, if you’re able to come across fresh tamarind.